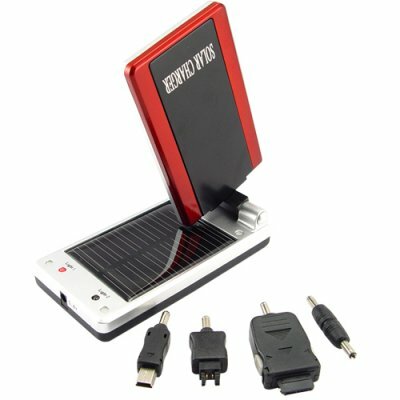 Successfully Added Solar Charger with Battery for Charging Cellphones and MP3/MP4 to your Shopping Cart. Solar charger with battery for charging cell phones and other portable digital media devices. Has your mobile phone lost power in a middle of an important conversation? Has your MP3 player played its last tune? Lets face it, we've all had our cell phones and portable media players run out of battery power when we needed it most. With the CVFR-S02 you will not have to worry about that problem ever again because you will have a portable power supply that can power your devices whenever you are away from home or the office! With its compact form factor, this solar charger is able to pack two high efficiency solar panels and a 500mAh internal li-ion battery all in one convenient to carry size. It is small enough to fit in your pocket, and it is easy to use by just attaching the cable to your cellphone or portable device and switching the ON button to start powering or recharging your cell phone or other portable electronic device. This product makes a great gift for yourself or the friend who likes useful electronic gadgets. This new arrival is available for single piece or bulk order now, from your source for wholesale direct from China electronics, Chinavasion.